Are you looking for a long-lasting, foolproof, affordable manicure option? Then you’ve got to try powder nails. This alternative for your manicure is a great way to get nails that look amazing, last a long time, and resist chipping and damage. Powder nails walk the perfect line between natural and artificial nails, giving you a strong coat of color that won’t come off until you want it to. If you want to see how to get the gorgeous look of our cover photo, we’ll show you how below. In this guide, we’ll show you everything you need to know about dip powder nails. Whether you plan to try it at home or in the salon, read on to learn all about this new nail trend. What Are Dip Powder Nails? A long-lasting manicure seems like the holy grail of the beauty industry. Traditionally, gel nails and acrylic nails have been the longest-lasting options out there. However, these options are pretty limited: gel nails often start to come off in just a week or two, and acrylics are expensive and difficult to apply. For those who want something in between, powder nails are a perfect choice. Powder nails offer an affordable, lasting alternative and can even be applied at home. Dip powder nails fall somewhere between the standard manicure and the acrylic or “fake” nail. While gel nails use UV rays to set the polish and make it last longer, powder nails use pigmented powders and an activator to set the color. Revel and SNS dipping powder are two of the most popular brands on the market. Once it’s applied, a powder manicure can last as long as three to four weeks. Although powder nails aren’t actually all that new (they’ve been around since the 1980s), they’ve recently become popular again, thanks to social media. Now, many salons and beauty supply shops are carrying dip powder options. To apply powder nails, a base coat has to be put on the nail first. Then, the nail is dipped into the powder. It might take a couple of dips to get a fully opaque color on each nail. Finally, a sealant is painted over the top, transforming the gritty powder into a glossy, smooth finished nail. Unlike gel nails, powder nails dry immediately, and you won’t need to expose your skin to unhealthy UV rays in the process. However, dip powder is similar to gel and acrylic nails in one important way: all three methods use acrylic as the base material. 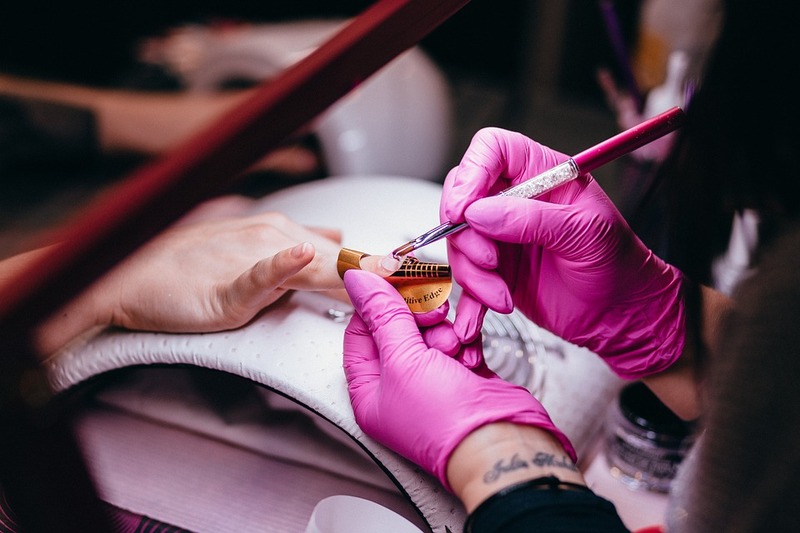 With acrylic nails, a liquid is mixed with powder to create an acrylic “gel.” And gel manicures use a pre-mixed acrylic liquid that chemically reacts and bonds to the nail when exposed to UV light. One of the main differences in powder nails is that the powdered pigment uses a finer grain so that the colors can be brighter. Cyanoacrylate is the glue that’s used to bond the dip powder to the nail — the same ingredient is found in super glue, which explains why these manicures last so long. Image: CC by 0, by StockSnap, via Pixabay. Should you try this trend in the salon or at home? In the salon, the application process is much faster than the process for applying acrylics. Getting powder nails takes about the same amount of time as getting a gel manicure. However, if you want to save money, or just like the idea of doing it yourself, you can also apply dip powder at home. The powder starter kits are a bit pricey, but you’ll still save money over time if you DIY your manicures. Several companies sell DIY powder nail kits that include everything you need. If you are short supplies for your DIY manicure, we have a great article on that, here. Now, let’s go over the basics of application. First, use your manicure block or emery board to smooth the surface of the nails. If you want, you can push back your cuticles. However, don’t apply oil on or near the surface of the nails, since that can keep the powder from sticking. Apply a thin layer of the prep coat to every nail. After it’s dry, apply a thin layer of the base coat to just one nail. Make sure to fully cover the nail, since the base coat is what the powder needs to stick. However, be careful not to get the base coat on the cuticles or around the nails. Otherwise, you’ll have a weak point where the gel coat can break off. Also, keep the base coats super thin, so you don’t get lumpy or uneven powder. As soon as you’ve applied the base coat to a single nail, it’s time for the dip powder. Place your finger in the jar of powder at an angle with the nail side up. After you remove your finger, tap the side of it against the edge of the powder jar to shake off any excess pigment. Work across each hand, applying the base coat and then powder to one nail at a time. Keep a soft brush on hand to wipe excess powder off of your hands and nails. If a little bit of the color remains on your skin, don’t worry — it will wash off later. Once you’ve coated every nail with a layer of powder, start over with a thin layer of base coat on a single nail. Repeat the process of applying base coat and powder to each nail, one at a time. It will take two or three coats to get an opaque, even color. Next, you’ll need to apply a coat of activator to each nail. This will make the pigment darker and more opaque. The activator makes the powder harden so that you can shape or file your nails after the first coat. Use your nail file to get the shape you prefer. You should also file the top of the powder to make sure the surface is smooth and even. Use the soft brush to dust away the excess. Now, you can apply a second coat of activator and let it dry completely. This will give you the smooth, shiny, long-lasting finish you want. Finally, finish the nails with a layer of top coat. Two coats will give you more durability — just make sure you let the first one dry completely before applying the second one. After it’s completely dry, you can finish your nails with some cuticle oil. Don’t forget to wash your hands to get rid of any extra powder. Image: CC0 Creative Commons, by Alehandra13, via Pixabay. If you are looking for nail art hacks or ways to dress up your powder nails, check out our article here. If you’ve had a gel manicure before, you’ll be familiar with the process of removing powder nails. Just like the application, this process is essentially the same whether you’re at home or in the salon. Powder nail pigments need to be soaked off, like gel nails. Avoid the temptation to chip the pigment away, since this can damage your nails. Apply a cotton ball dipped in acetone polish remover to the top of each nail, then wrap the nail with aluminum foil to keep the cotton ball in place. Since the acetone will probably drip, do this over an old towel if you’re removing the powder at home. Wait for about 10 to 20 minutes before taking off the foil. The longer you wait, the easier the removal process will be. As you pull the foil off, the powder pigment should stick to the cotton ball and come off with it. Start with one nail, and if the pigment isn’t coming off yet, wait a bit before trying it again. Since the powder was applied in layers, it might come off in layers, so repeat the process as needed. Every time a new nail trend hits the market, it seems like some health concerns come with it. Are the concerns about powder nails legitimate? Some salons market dip powder as a “natural” way to do your nails, which isn’t exactly true. All acrylic nail treatments contain the kinds of chemicals that most people would consider “unnatural.” However, that doesn’t mean they’re dangerous: powder nails don’t contain anything worse than what’s found in traditional nail polish. The good news about powder nails is that there’s no risk of powder inhalation and no damage from the UV rays used to cure gel polish. If you’re okay with acrylics and gel manicures, you’ll be fine with powder. Just be careful to remove it properly, so your nails don’t get damaged. Image CC0 Creative Commons, by niekverlaan, via Pixabay. 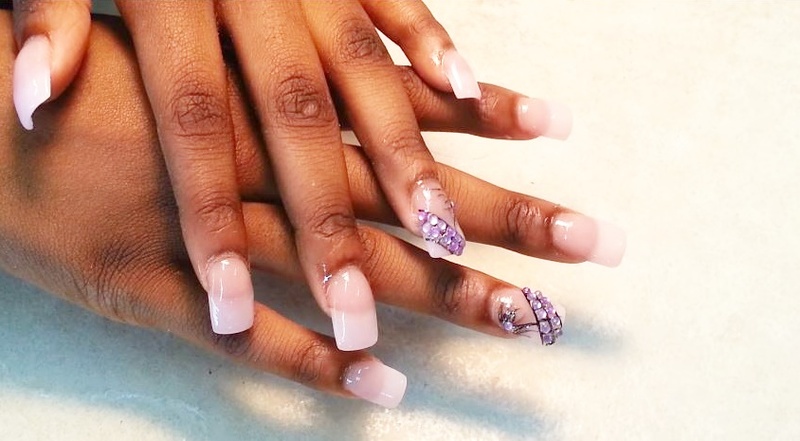 In the salon, dip powder generally costs less than acrylic nails and about the same or slightly more than a gel manicure — many salons charge $5-$10 extra for powder. Most people find the slightly higher price worth it since powder nails last longer than gel nails. Dip powder starter kits for home use generally run about $50 or more. Although this is more costly than traditional nail polish, it costs less than salon visits since each kit gives you enough materials for multiple applications. Will You Try Powder Nails? This trend has been around for decades, but it’s finally become popular again in the era of YouTube and Instagram. 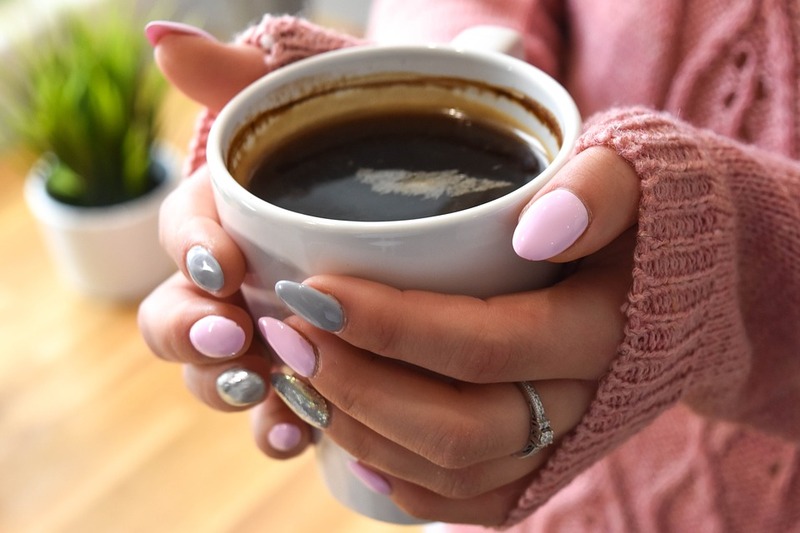 Diehard fans of acrylic nails might like the powder option when they want to give their nails a break, and gel manicure fans can enjoy the fast dry time and long-lasting effects of powder. If you’re looking for a vibrant, durable manicure that will stand out, powder is a great choice. Plus, the unique application process can be fun. Will you give the dip powder trend a try? Leave a comment and let us know!